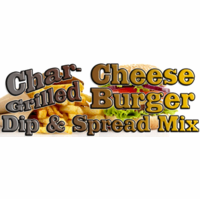 Char Broiled Cheeseburger Dip Mix & Spread Mix by All Mixed Up, Ltd. Description: An all-American classic turned dip...that's what we have here, folks! Step right up with your potato chips, veggie sticks, freedom fries, and pretzels to savor the distinct taste of an all-beef hamburger char-broiled on the grill and covered with a slice of American cheese. Do you like pickles on your burger, or maybe onion? We've got that covered. Features: No MSG added. Gluten Free. Vegetarian. Made from scratch, in small batches, from our own original recipe in Ohio. Abbreviated Ingredients: cheddar cheese powder, onion, sea salt, herbs & spices, garlic, vinegar powder, grill flavor powder, paprika. Contains Milk. Packaged in a facility that packages wheat, milk, soy, egg, peanuts, and tree nuts.